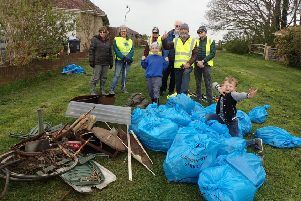 Members of Ferring Conservation Group have been carrying out practical work to improve the village environment and make it more welcoming for wildlife. The first meeting of the new monthly working parties included removing brambles growing near the community orchard at Glebelands Recreation Ground. The large tawny owl nest box was relocated, as it had been unsuccessful at Warren Pond. Tree surgeon Shane Jones, from Worthing company Mr Tree, was called in as climbing equipment was needed to safely mount the box in a suitable tree. A bat box donated by members Lindsey and Chris Green was also fixed to a large sycamore tree in a nearby copse of trees. Jane said: “Time will tell but we hope that the local tawny owls and bats approve of what we’ve done for them, especially as their natural nesting sites are reducing in number and suitability. “We’ll be keeping an eye on the boxes, which are in addition to the significant number of smaller nest boxes that we’ve already put up around the village. The next working party will be on Tuesday March 6, at 10am, meeting on the village green. The task will be to cut back some of the bushes and tidy up the area. Volunteers are advised to take secateurs or loppers, if possible, and to wear suitable clothing.